Our Latest CD has a new look Please note that the CD Mandara Music Sampler is the repackaged “World Music for Western Percussion Ensemble”. Mandara Music Sampler has exactly the same great percussion ensemble pieces as does the World Music for Western Percussion Ensemble. 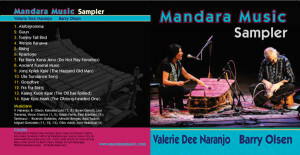 Mandara Music Sampler, while being a guide for percussion ensembles using Western instruments, is also a great listen. This “Best of” CD provides example ensemble recordings for Abibigromma, and Guun – for soloist and percussion quartet (Ghana), Tommy Tall Bird (Dineh, Native America) and “Rising (Naranjo, Olsen, Palombo); for the West African Music for the Marimba Soloist transcriptions Wenda Kanawa, Kpanlogo, Jong Kpek Kple, Kaang Kuon Kpar, and Fer Barre Kona Jeno (the trio version. The Orchestral Version can be found on the CD Concertos by the CYO of Cleveland.) There are also included new selections for the recent WAMMS transcription book “Song Collection #2” The new title Mandara Music Sampler has made the CD friendlier to listeners who are not specifically percussionists.